It was definitely a tight squeeze. I'm not saying it is extremely spacious now, but it's a lot better. There were a lot of design problems in our bathroom before. The door opened inward and took up so much space. Trying to get to the toilet between the sink and the door was always a treat. Having a shower curtain closed off almost half of the space and the tile on the floor was broken and stained. 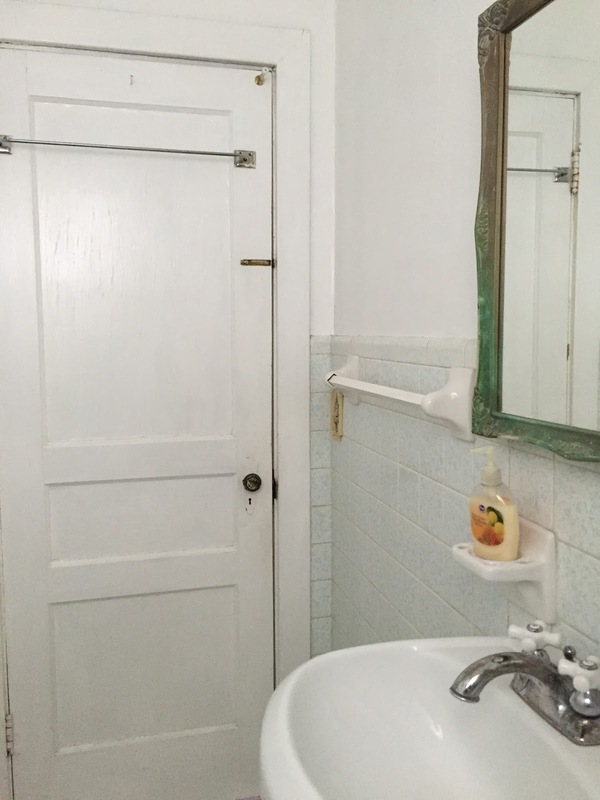 There was a wall behind the door that was actually a closet that opened up into the room behind the bathroom. 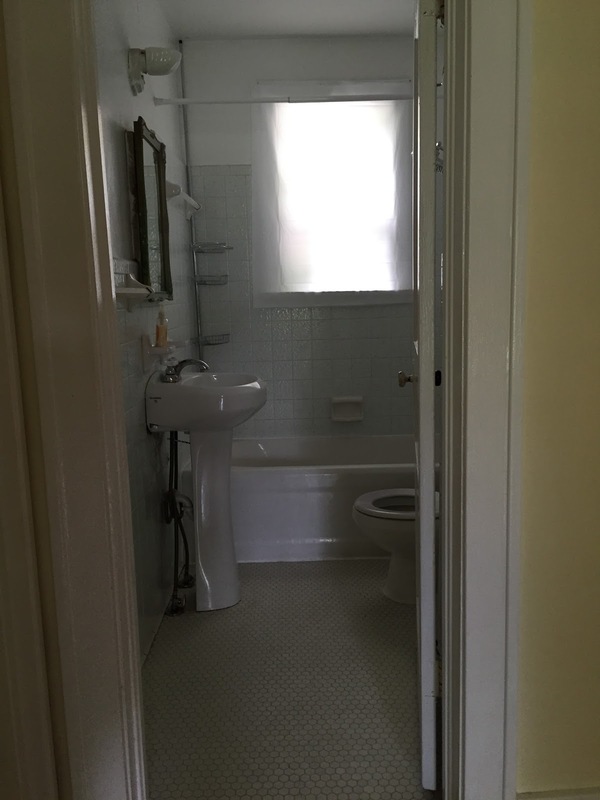 Plenty of things that needed an upgrade, but we knew this bathroom wouldn't be renovated for a while after moving in. But then one day the ceiling fell in. We apparently had some plumbing issues in the upstairs bathroom and it had been dripping into the ceilings below. One night we came home around midnight and the ceiling in the bathroom looked pregnant. There clearly was a problem, but we couldn't do anything about it that late at night. Around 5 in the morning the ceiling fell in. Cue bathroom renovation time! The bathroom ended up having to be gutted. The floor had to be rebuilt. New walls, new window, new bathtub, toilet, sink, hardware, plumbing, tile, and the list goes on. One of the greatest updates is that the closet now opens to the bathroom! We didn't have any hidden storage before, but now we have the cabinet under the sink and a whole closet. It's a tiny closet, but it's perfect. We searched for a sink that 1) had a nice design and 2) had a smaller depth than the one we had before. We wanted to open the space up as much as possible. Our bathroom was like a dark hole originally. There was one light and a small window. 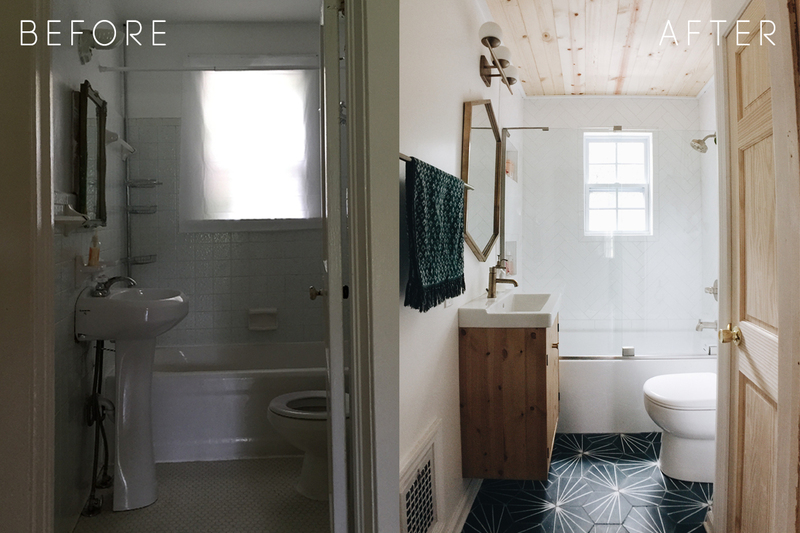 Our goal was to have a brighter bathroom, which was not hard to do. We got a new door which now matches our other doors in the hallway. The door now opens into the hallway which frees up some space in the bathroom. We thought this would be hard to adjust to, but it wasn't an ordeal at all. In the bathroom before there was no outlet, so we definitely had to add one. We knew we wanted our hardware and shower head etc. to be gold. If you've ever looked for these things in gold, you know they are very pricey. Casey found the Delta Trinsic collection that has a color called "champagne bronze" and it was affordable and a gold-ish color that wasn't yellowy. We found a spray paint color that matched pretty well and we painted our mirror (because it was really yellowy) and soap pump. Another favorite thing in the bathroom are these little nooks for shower things. Originally we had this three layered metal caddy that things always fell out of. Plus it was ugly. Every time I take a shower now I admire these built in shelves. Everything has place and nothing falls out. The glass door was really important for this renovation. We wanted to make the bathroom seem larger and having a barrier, like a shower curtain, seemed like it'd be working against that. Plus we had the tile laid in this fun herringbone pattern and it needs to be seen. You don't want to do all that work and then cover it up! Casey's stepdad had put up a wood ceiling to close off what had fallen down. (After the plumbing had been fixed of course.) It had to be pulled down during renovation, but we decided to keep the same situation. It really adds character to the space. Okay other favorite thing of the bathroom- the tile. This was THE biggest dilemma of the bathroom. 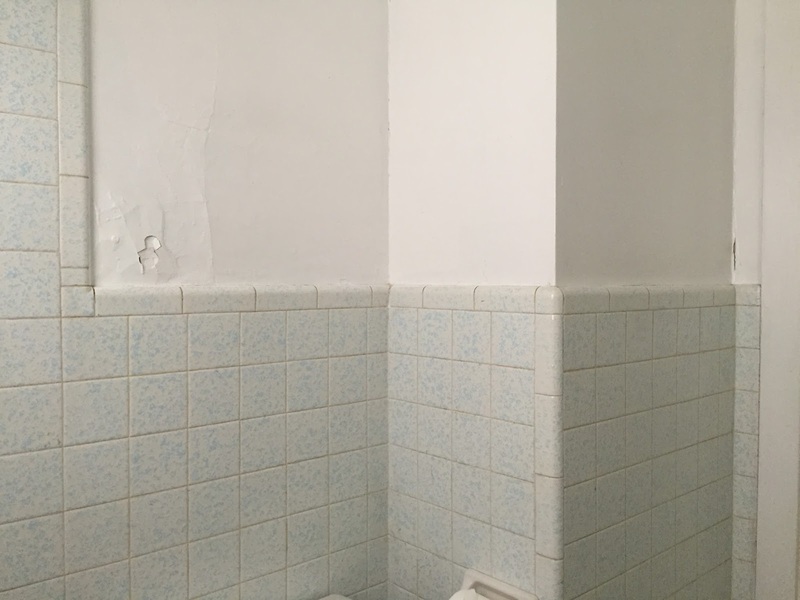 The tile held up a lot of the renovations. Originally we wanted black and white tile. There weren't too many good options in black and white, but we found a few. When we finally decided on one it was this one but in black. Then of course, we couldn't get it for 8 weeks. We needed the tile ASAP so we had to choose between a gray color and this blue color. I feel very anti-gray in most situations so the blue seemed right. Everyone agreed that the blue would work great and it was settled. We also had to decide if we wanted light or dark grout. We had our tile guys special mix a gray that was the same darkness of the blue. We saw some examples of people using white grout and it really changed the design. Anyway, here it is! 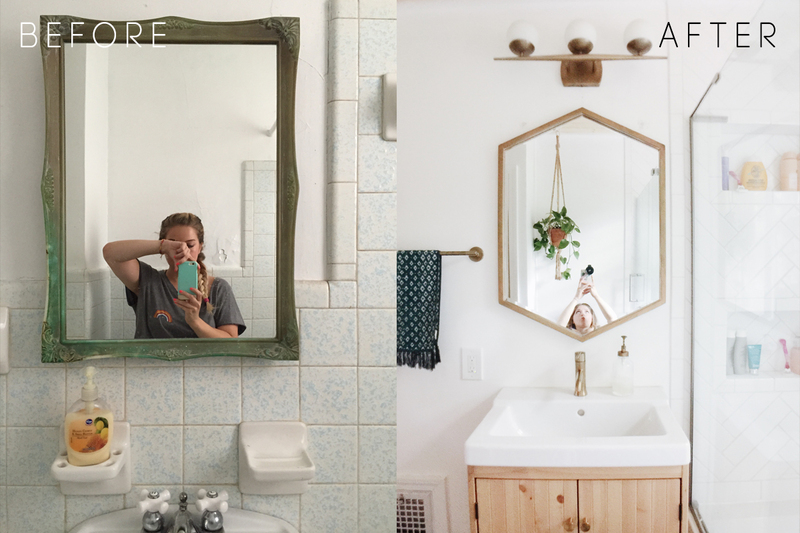 I feel like we've been talking about this renovation forever, and it's finally done! And we love it. I'm going to try to tell you where everything is from below! I LOVE how it turned out! Your original bathroom sounds a lot like our bathroom we hope to renovate soon. I love everything, especially the blue tile on the floor you chose! This is amazing!! My bathroom is the same size, so I understand the struggle, lol. I love the sink and toilet you used, the smaller sizes really add so much more space. They're almost exactly what I've pictured using whenever I can finally renovate my bathroom. And I think I love the navy, white, and gold more than I do black, white, and gold. It's been update to provide links. 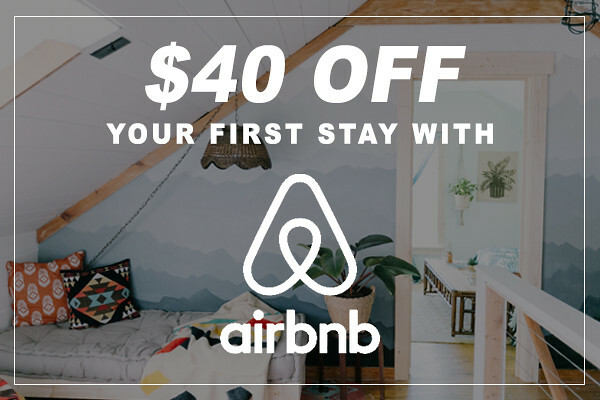 Can you also provide a link to or the name of the light fixture! It's been updated with some of the links now. 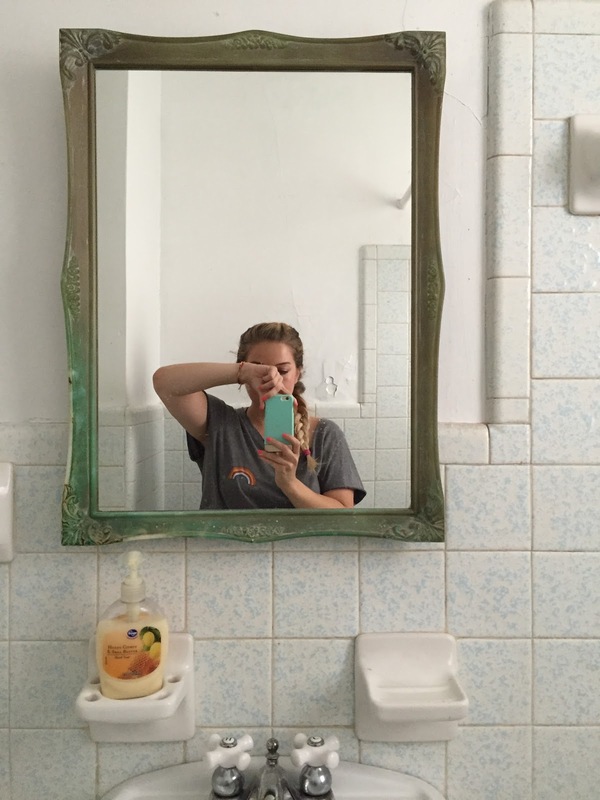 I absolutely love that picture of the two of you doing your makeup in the bathroom!